Glenn Alfred Beckert (born October 12, 1940) is an American former professional baseball player. He played in Major League as a second baseman for the Chicago Cubs for nine seasons from 1965 to 1973 before ending his career with the San Diego Padres in 1975. Beckert was drafted from Allegheny College as an amateur free agent by the Boston Red Sox in 1962, then selected by Chicago Cubs from Red Sox in the first-year minor league draft. He spent three years in the minors as a shortstop, where he led the Pacific Coast League in putouts and assists in 1964. 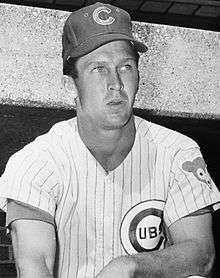 Following the sudden death of Cubs second baseman, Ken Hubbs in 1964, the Cubs brought Beckert to the major leagues as their second baseman for the 1965 season. Beckert played nine seasons as the Cubs' second baseman. During his entire Cub tenure, he played alongside shortstop Don Kessinger. Beckert led the National League in assists during his rookie year, and went on to become a four-time All-Star. He was a tough batter, leading the league five times in fewest strikeouts per at bats. In 1968, he led the league in runs and won the National League Gold Glove Award for second baseman. He had his best offensive season in 1971 when he had a .342 batting average to finish third in the National League batting championship behind Joe Torre and Ralph Garr. After the 1973 season, he was traded along with Bobby Fenwick to the San Diego Padres for Jerry Morales. Beckert was a utility infielder and pinch hitter with the Padres before being released in April 1975. He is an inductee in the Chicagoland Sports Hall of Fame. In an 11-year career, Beckert played in 1,320 games, accumulating 1,473 hits in 5,208 at bats for a .283 career batting average along with 22 home runs and 360 runs batted in. He posted a .973 career fielding percentage.